Only 24 SLT models left in stock! 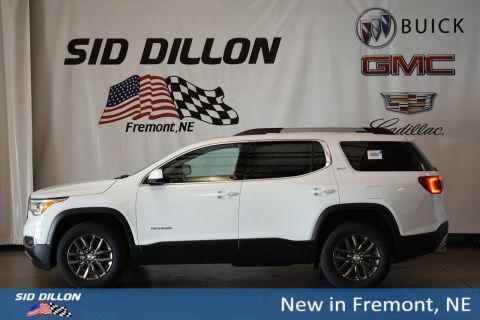 Safe and reliable, this 2019 GMC Acadia SLT makes room for the whole team. Tire Pressure Monitoring System with Tire Fill Alert, Tire Fill Alert provides audible alerts outside the vehicle when inflating an under inflated tire to the recommended tire pressure., Teen Driver configurable feature that lets you activate customizable vehicle settings associated with a key fob, to encourage safe driving behavior. It can limit certain vehicle features, and it prevents certain safety systems from being turned off. An in-vehicle report card gives you information on driving habits and helps you to continue to coach your new driver, Rear Vision Camera, Rear seat reminder. Rear Park Assist (Included with (B26) Driver Alert Package I. ), Rear Cross Traffic Alert (Included with (B26) Driver Alert Package I. ), Passenger Sensing System sensor indicator inflatable restraint, front passenger/child/presence detector (Always use seat belts and the correct child restraints. Children are safer when properly secured in a rear seat in the appropriate child restraint. See the Owner's Manual for more information. ), OnStar and GMC connected services capable (Fleet orders receive a 3-month trial. Visit onstar.com for coverage map, details and system limitations. Services vary by model. ), Lane Change Alert with Side Blind Zone Alert (Included with (B26) Driver Alert Package I. ), Horn, dual-note, GMC OnStar 4G LTE and available built-in Wi-Fi hotspot offers a fast and reliable Internet connection for up to 7 devices; includes data trial for 3 months or 3GB (whichever comes first) (Available Wi-Fi requires compatible mobile device, active OnStar service and data plan. Data plans provided by AT&T. Visit onstar.com for details and system limitations. ), GMC Connected Access with 10 years of standard connectivity which enables services such as, Vehicle Diagnostics, Dealer Maintenance Notification, GMC Smart Driver, Marketplace and more (Limitations apply. Not transferable. Standard connectivity available to original purchaser for ten years from the date of initial vehicle purchase for model year 2018 or newer GMC vehicles. See onstar.com for details and further plan limitations. Connected Access does not include emergency or security services. Availability and additional services enables by Connected Access are subject to change. ), Door locks, rear child security, Daytime running lamps, LED, Air bags, frontal and side impact for driver and front passenger driver inboard seat-mounted side-impact, driver side knee and roof-rail side-impact for all rows in outboard seating positions (Always use seat belts and the correct child restraints. Children are safer when properly secured in a rear seat in the appropriate child restraint. See the Owner's Manual for more information.). TRAILERING PACKAGE INCLUDES FACTORY-INSTALLED HITCH 4000 lb. towing, 7-pin wiring harness, Class III hitch, (V08) heavy-duty cooling system and Hitch Guidance with Hitchview, TRANSMISSION, 6-SPEED AUTOMATIC (STD), TRAILERING PACKAGE INCLUDES FACTORY-INSTALLED HITCH 4000 lb. towing, 7-pin wiring harness, Class III hitch, (V08) heavy-duty cooling system and Hitch Guidance with Hitchview, TIRES, P235/65R18 ALL-SEASON BLACKWALL (STD), SUMMIT WHITE, SLT PREFERRED EQUIPMENT GROUP includes standard equipment, SEATS, FRONT BUCKET (STD).